It starts off innocently enough. I’m making a piece for a client, and then it happens. I’m cutting the pattern out of the fabric, like any other project, and the butterflies start. I rush to the sewing machine, eager to see it become what I see in my mind. I begin to grow attached, find myself staring at it as it comes together, unable to go to bed until it’s *at least* almost finished. I won’t finish it that night, because I know that the sooner it is done, the sooner it will leave my possession. I accept it. I’ve fallen in love with the piece, and I want to stretch my time out with it for as long as possible. Don’t get me wrong-I put my heart, and all the skill I can muster, into every piece I create! But sometimes, something about a certain item, or maybe the person it is going to when it is a gift, creates a different energy. Last week this very thing happened again. My friend Heather had asked me to create a backpack for her, and it was her turn in my sewing queue. Her first choice of fabric was unavailable, but we found this black and white version of it, and I convinced her to let me play with the coordinating medallion pattern. I based it off my “Essentials”pattern, with a few modifications per her request. I also added resin snaps to the sides, so that the side gussets can be snapped flat when the bag is less full, but opened up when it needs to hold more. It has 1.5” wide woven cotton straps, and silver sliding buckles to adjust the length. I hope I have some free time in the fall, because I certainly want one for myself! in the meantime, I’d love to make one for you! So, check it out…here is the one that got away! 🙂 If you would like one of your own, please email me at susie@freerosestudio.com to place a custom order. The Essentials Backpack is $85, and can be made in this combination of fabrics, or from another pattern in my current stock (email to see current availability). Echino Birds totes are back! Last summer I purchased a lovely Echino linen fabric in a birds print, and made a bag and a handful of wallets. The fabric was from Japan, and I fell in love with the feel and look of this print. Then I found out it was sold out everywhere online! I was so sad to not have a chance to make any more nice things with it. Fast forward to last month, when my husband, Marc, and I took the bambino on a quick trip up to Austin. We ended up by a small, independent fabric store I had not visited in some time. I started to get very excited when we parked, as there was a sign advertising they were now carrying the Echino line. I don’t think you can imagine my joy when I found they still had not one, but two of the birds color ways!! I bought what I could, brought it home, and got to cutting. I started with the biggest projects first. Today I am so happy to unveil the first three bags made from this small stash of sold-out fabric. They are each made from my “Essentials” pattern, and feature all the inside pockets and divider that help keep your belongings organized and easy to find. You can find them all in my Etsy shop. “The Essentials” pattern is a multi-purpose bag I designed that is just the right size to hold it all without being bulky. It works great as an oversized purse, diaper bag, carryon and even as a school bag (will hold most average laptops). It’s layered canvas construction and cotton straps will carry your items with ease and provide many years of use. Each bag features a different lining color scheme, as well as contrasting trims; truly making each bag one of a kind. Please see the listings for detailed photos. -Interior Divider features two flat 6.5″ tall pockets. -Durable, double stitched seams and reinforced stress points. -Contrasting trim on inside pockets. Interior is made of sturdy duck canvas. -Outer features a beautiful, Japanese linen fabric featuring birds and vines. Polka dots line the sides of the bag. Linen fabric is backed with duck canvas for strength. Thank you for visiting Free Rose Studio! Please come back again, and browse the wares on Etsy! I’m so excited! i just entered my first blog contest! Submissions are being accepted until Sept 30, should anyone else wish to enter their own creations. Then-the voting will begin! The bags that have been submitted thus far are beautiful and inspiring, lots of creative ideas and there’s still 3 more weeks to go. You can view them here. In other news, I had some goooooorgeous fabric arrive today. Some Alexander Henry prints that are to DIE for! Did you get my hint? 😉 Look for some pics in the next week or two. Enjoy the weekend, Friends! Ok, that’s a bit of an exaggeration. I guess there’s not really too much mystery to it. But this new bag is exciting because it’s my first international, off the North American continent order! Free Rose is going abroad! And…to make it even more exciting, it’s a new style. I would like, if I may, to show you the lovely messenger strap option. The bag shown was created especially for Jess, a lovely gal “across the pond,” as they say. She just had her second baby and needed all the space she could get in a diaper bag. Since she is out and about with 2 under 2, a messenger style strap was a must! 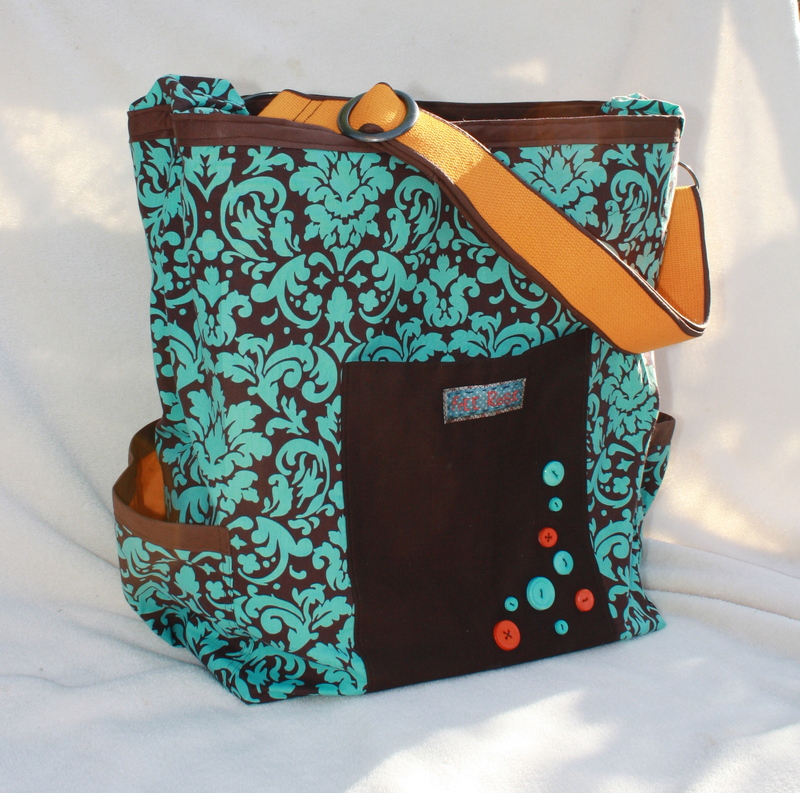 Like the Daycare Diaper Bag, it features two outside drink pockets and a large exterior pocket in the front. I added some button detail in both the aqua and contrasting orange color. The sturdy 100% cotton strap is 2″ wide, and is hand dyed to match the color scheme of the bag. Brown cotton bias along the edges finishes it off and ties it in with the coordinating trim on the rest of the diaper bag. Lovely coordinating hardware polishes it all off. The extra long strap adjusts for Mom or Dad. …but separates when needed to allow full access to the interior. This is helpful when getting everything packed and unpacked. The coordinating Aqua and Brown cotton interior is crisp and clean, and each Aqua pocket is trimmed in narrow brown bias trim. A snapping clip keeps a toy, paci, or keys handy. Interested in ordering a messenger style oversized bag? It’s not just good for baby supplies, with customizable pockets this would also make the ideal travel bag, beach bag, or school bag. Email me at Susie@FreeRoseStudio.com, or visit my Etsy store. All bags are one of a kind, custom made to order; you choose the main fabric from my current availability and I will create something wonderful just for you. I can’t wait to see pics of Jess and her darling angels out and about with her new satchel! As always, thank you for checking in at the Free Rose Studio! Any ideas of something you’d like to see here? Please comment or email them to me! …and wouldn’t a custom bag be a thoughtful gift? Give the special mom in your life a gift card to receive her own hand-made-just-for-her-because-she’s-awesome bag! How does it work? Simply purchase the “Custom Oversized Bag” listing in my Etsy store, and I will send a handmade card to the recipient (or to the giver if they would like to present it themselves), letting them know to contact me to choose the fabric for their bag. After they have notified me of their choice, I will create their gift and mail it to them (gift wrapped, of course) within 2-3 weeks. Imagine the delight Mom will experience knowing it was created just for her! And imagine how easy this amazing gift will be for you-just an email and a few clicks and you’re a hero. If you would like to send a smaller gift, gift cards for custom pouch slings and ring slings are also available. Smaller bags of the same excellent quality are available at a lower price, please email or contact me to discuss! There’s a way to meet most any budget. I just finished up this beautiful bag today, and can I say I am in L-O-V-E LOVE?! This one is going to be hard to part with!! The floral pattern is complimented with a whimsical leaf pattern on the side pockets-notice the tiny squirrels and foxes. I just couldn’t resist using that print somewhere. A zip-top option was added to this order, as shown below. The top can be unzipped completely to allow full access to the interior. Inside you’ll find the standard pockets included on the base bag: 2 Large cloth diaper/blanket/change of clothes pockets, one cosmetics/”Mommy” pocket, a divided pocket, and also a snapping key/toy loop. The slings (laying inside) are not included but can be added to coordinate with any order. And of course, the back….I would love to make another similar to this for a special someone because I just can’t wait to sew with this floral print again. Is it wrong to love a pattern? Parents with children in daycare know that the list of things you need to take with you-besides the baby-can seem endless. Make your mornings a little easier with this oversized diaper bag, it will help keep you organized with a place for everything. Made with your choice of fun cotton print and lining, a hidden inner layer of water resistant canvas give the bag it’s shape and adds durability. Measuring 17″ tall 15″ wide, and 7.5″ deep, it’s roomy but easy to carry. The outside features a large zippered pocket (optional embroidered name), and two side pockets, each of which can easily carry 2 bottles or sippy cups. The interior of the bag has a sturdy divider, perfect for dividing blankets and sheets from extra clothes and bibs. Two extra large side by side pockets are large enough to hold cloth diapers, or to store changes of clothes, disposable diapers, burp rags, etc. 2 more pockets add extra storage space, perfect for snacks, pacis, or your wallet. A snapping loop is perfect for keeping your keys handy, or keeping track of small toys. Contrast trim edges the tops of the pockets, adding a beautiful contrast and making them easy to find. Soft and sturdy cotton straps wrap around the bag to distribute the weight and keep it comfortable on your shoulder during long trips. Not just for daycare, this oversized diaper bag is perfect for the beach, long trips, flying, and moms with more than one child. Adult prints are available, this would be a great overnight or carry one bag as well. If you would like one of your own, please click on any of the pictures to view the etsy listing, choose the “Shop” tab above or email me at Susie@freerosestudio.com! I will provide you with many beautiful choices of exterior fabrics, which I will then beautifully match with two contrasting fabrics for the interior and trim. If you have other pocket needs, I will be happy to accommodate them, available options include a cell phone pocket, waterproof water bottle pocket, insulated bottle pockets. This bag can also be made as a messenger style bag, with a single adjustable strap. This one-of-a-kind bag will be made to your specifications, you’ll receive a bag hand patterned and crafted just for you, with one line of professionally embroidered text, for $72 plus shipping. Please contact me for more information or to start the order process, this beautiful and functional bag is perfect for upcoming summer travels!